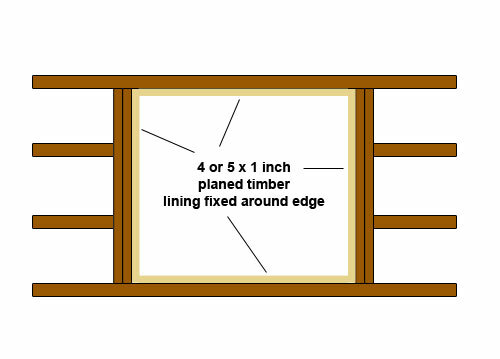 In this DIY ceiling hatch project we explain how to make your loft hatch bigger, including strengthening timbers when enlarging or installing a loft hatch to prevent any weakening of the roof or supporting structural timbers. Find out all you need to know about enlarging a loft hatch in our easy to follow guide or how to install a loft hatch, what types of loft hatch are available e.g. 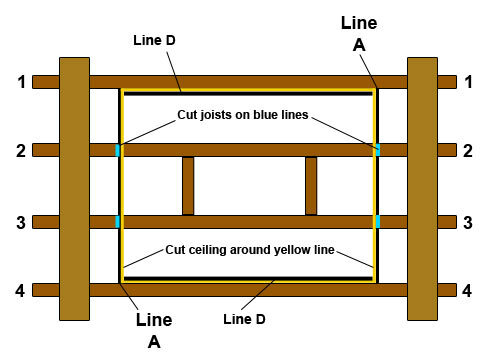 insulated loft hatches and loft hatches with built in ladders and how to finish the visible part of your new loft hatch on your ceiling. Also find out about the various regulations that govern what work can be carried out in a loft area. Please note that if you plan to make your loft into any kind of living accommodation you must first get building regulation approval. There are many regulations governing the conversion of lofts. See our related projects on the right for more information. Caution: Roof trusses, whether traditionally hand cut or pre-made as a unit, are designed specifically to carry the weight of your roof. If they are cut then the roof is weakened unless you follow the instructions below 100%. If you are in any doubt whatever please consult a professional though our Find a Tradesman service. The same can also be said for traditional roofs (non trussed roofs) as in most cases they have been designed to cope with a specific weight and cutting or removing sections of roofing timber could cause catastrophic failure. 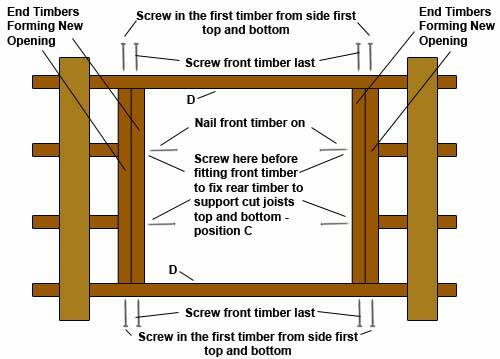 If you are in any doubt as to whether a particular timber is structural or not, please check with a professional. What Type of Loft Hatch are you Going to use? When it comes to fitting a new loft hatch, whether it is a direct replacement or an entire new hatch you have two choices. You can either build your own bespoke hatch or you can now buy ready made loft hatches that you simply fix into your new opening. There are a great many ready made loft hatches available on the market today so it’s well worth checking these out before you start as a pre-made solution could be the best way to go. Also consider an insulated loft hatch. 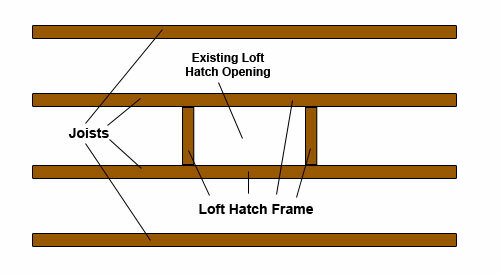 Depending on the size of the opening into your loft that the hatch will fit into will really dictate this as most ready made hatches are made to set sizes. If your new opening is going to be a slightly odd size then a bespoke build solution may be the only route you can take. Additionally you may also want to think about the type of loft ladder you are going to use. You can also get all-in-one loft hatch and ladder kits as can be seen below. Check that the enlargement you would like does not involve cutting through any main supporting beams or timber lintels which may protrude into the loft space. As mentioned above, if in any doubt, seek advice from a professional. As the information below is geared towards enlarging an existing loft hatch you should have something similar to the image below. If you are starting from scratch e.g. you don’t currently have a loft hatch this may be for a reason so first check with a structural engineer or relevant professional. If they give you the all clear to go ahead and create a loft hatch you will first need access the loft area by cutting a hole in your ceiling. Before you go about cutting holes, use a stud, pipe and wire detector run over the area you would like to cut to make sure there are no pipes and wires up there. This will also detect your ceiling joists and dictate where you can create your access hole. 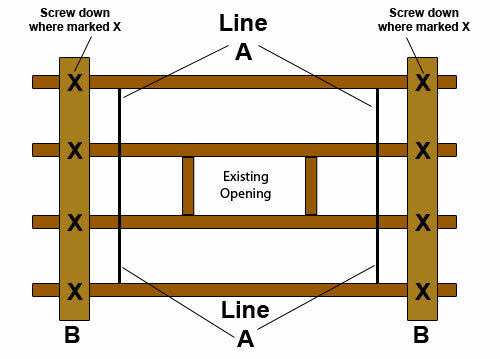 Using a pencil, mark the edges of any joists on the ceiling, this will then create your access hole. Use a drill and suitable drill bit to create enough holes in one of the corners to allow you to insert a saw and cut along the lines that you have marked out. 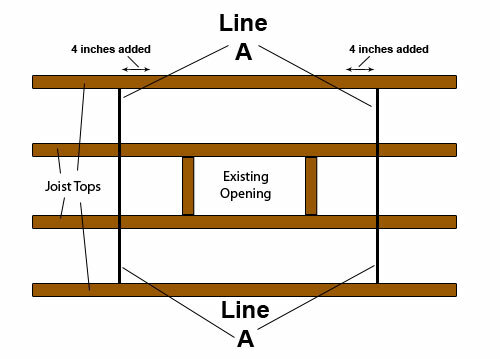 With your access hole created, follow the below instructions to create your loft hatch. Using the diagram below, follow these steps. Preferably a loft hatch would have a maintenance free finish which could just be wiped down. The finger marks on a hatch can be really unsightly but are quite hard to remove from an old painted surface. Look for a loft hatch that requires a quick wipe over and no painting! As mentioned above, look for a hatch with insulation material fixed to the back (preferably fire resistant). 35mm of insulation is standard but 50mm is better. 105mm is the ideal amount of insulation to comply with part L of the building regulations. Find a hatch that does not need an enormous frame reducing the size of the opening you are trying to enlarge! If you are thinking of renting out your house or just have very adventurous children, look for a lockable hatch. 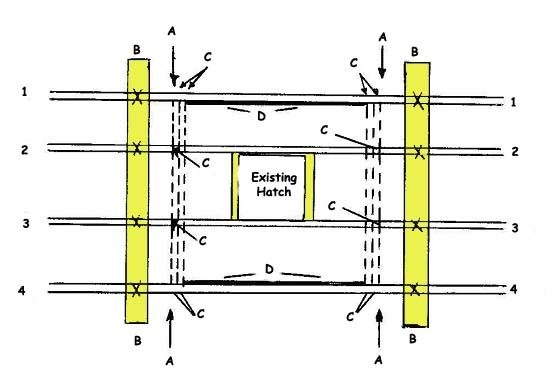 Look for a hatch with draught seals. Lofts can be draughty places!